"Your deeds are not in vain before Me. I see your yearning and zealousness. Take care, that no one will stop you in this drawing toward Me, because in this coming year - my strength will be manifested in a lot greater measure than in previous times. The days i promised to the prophet Joel are coming (See Joel 2:28-29). I am pouring out my power as never before. 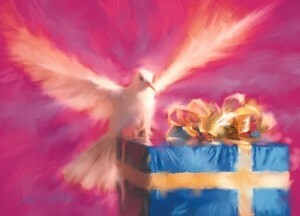 My gifts will be revealed in the Body of Christ in the incredible power of the Holy Spirit. It hasn't happen before. It's a new time for you. And my Spirit is bringing gifts that were never even manifested on the Earth. The gifts of the Holy Spirit will overwhelm the Church. But many in My Body will stand up against it, not understanding Who they struggle against. Previous experience and walk with Me will keep these people from understanding and receiving these gifts and their manifestations. And not only that. There will be such that will raise up against their brother, saying that it's not from the Lord. Some will act like this completely sincerely, not understanding that I move in this and perform miracles. Some act in this way out ofenvy, not entering and letting other to enter and taste how good is the Lord. But remember what John had said: "He came unto his own, and his own received him not. But as many as received him, to them gave he power to become the sons of God, even to them that believe on his name:" (John 1:11-12). And it is also written: "And there are also many other things which Jesus did, the which, if they should be written every one, I suppose that even the world itself could not contain the books that should be written. Amen." (John 21:25). That is why i am telling you, many things which have happened - you never read about them, because they are not written in the Bible. But it is written there: "Verily, verily, I say unto you, He that believeth on me, the works that I do shall he do also; and greater works than these shall he do; because I go unto my Father" (John 14:12). And remember that if "....the master of the house was called Beelzebub, how much more will be those of his house called?" (Matt. 10:25, Luke 11:15). And truly My Word is saying that in the last days "And because iniquity shall abound, the love of many shall wax cold." (Matt. 24:12). And all of this will happen to test you: will you protect yourself and fend for yourself or will you let My vengeance to take place, and only fulfill your part? I will pour out these gifts, that you may praise Me and safe people that are appointed by Me to salvation. I give out my gifts, because i am zelous for My Church and I want to glorify it, because it is My Bride. Behold, I told you, ahead of time what will happen. Literally during the next three months you will see a change in your spiritual life. Choose my way and do not turn to the shoulder of the road. And the gifts that will be poured out by Me are not the goal, the goal - to bring My Love and Glory on this earth, because precisely there, in My supernatural presence will occur immense changes, that will effect the entire planet. Dear ones! One more time Happy 2011! I pray that the God of Abraham, Isaak and Jacob will open heavenly windows over your life and that a visible special harvest would come as a result of your decision to saw in the ministry to Israel.